Score Expression error: Unexpected < operator. Expression error: Unexpected < operator. 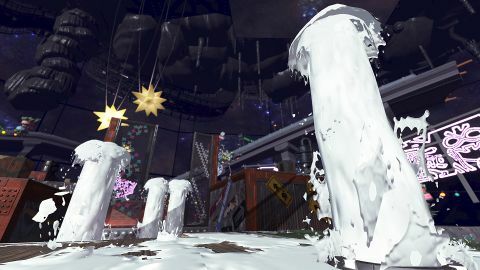 Pocky Chocolate vs. Pocky: Gokuboso was a Splatfest event in Splatoon 2. It was held in Japan only. It took place on 10 November 2018. It was announced on 26 October 2018 on social networks. The results were given on 11 November 2018. 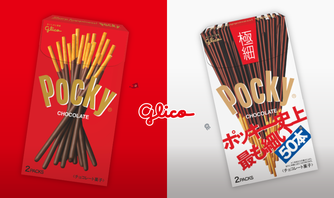 This Splatfest is part of a collaboration between Nintendo and Glico, promoting their snack brand, Pocky. The two Splatfest teams represent the oldest product in the line, Pocky Chocolate, and the newest addition, Pocky: Gokuboso (literally: Pocky very fine/thin. Marketed as "Pocky Ultra Slim" in English-speaking markets). As part of the promotion, a page was created under the Pocky website, promoting the in-game event, as well as real-world collaboration items such as t-shirts and branded snacks. 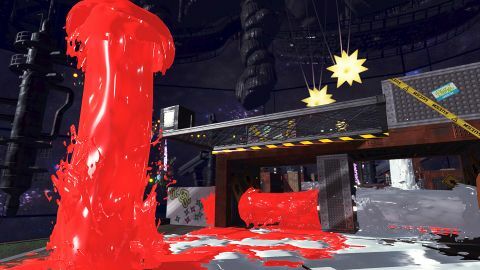 It also contains promotions and contents to be held before the Splatfest, each pitting the two snacks against each other. The site prominently features two characters, each wearing one team's ink color and Splatfest Tee: an Inkling boy (wearing Squidlife Headphones and N-Pacer Au, and wielding a Carbon Roller) for team Pocky Chocolate, and an Inkling girl (wearing Knitted Hat and Punk Whites, and wielding a E-liter 4K) for team Pocky: Gokuboso. Pocky Chocolate vs. Pocky: Gokuboso featured the 16th Shifty Station layout, "Kanketu". Notes: ポキッと, "poppingly", sounds very similar to ポッキーと, "Pocky and..."
Notes: Gokuboso literally means "very thin", but it is also the term used for hairline or extremely fine pens. Pearl also refers to the Pocky as "those guys", which is odd when describing food. Notes: The word ポッキリ, "snap", sounds very similar to the word ポッキー, "Pocky"
Notes: Here, by saying "strong", Pearl means that it's better in a fight - not that it is physically tougher. Notes: The word Pearl uses for "easy" also means "light" when referring to foods. This page was last edited on 5 April 2019, at 01:24. This page has been accessed 4,573 times.